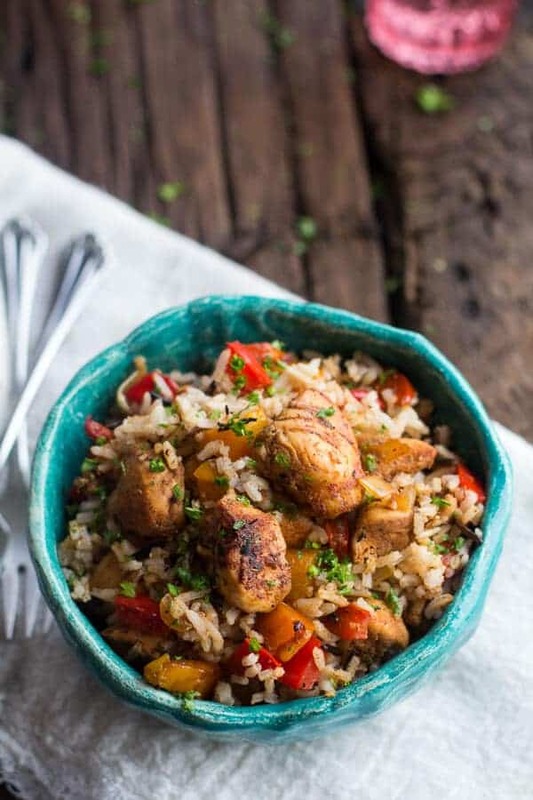 30 Minute Healthy Kickin’ Cajun Chicken and Rice + Video. No salads today. Happy New Year! 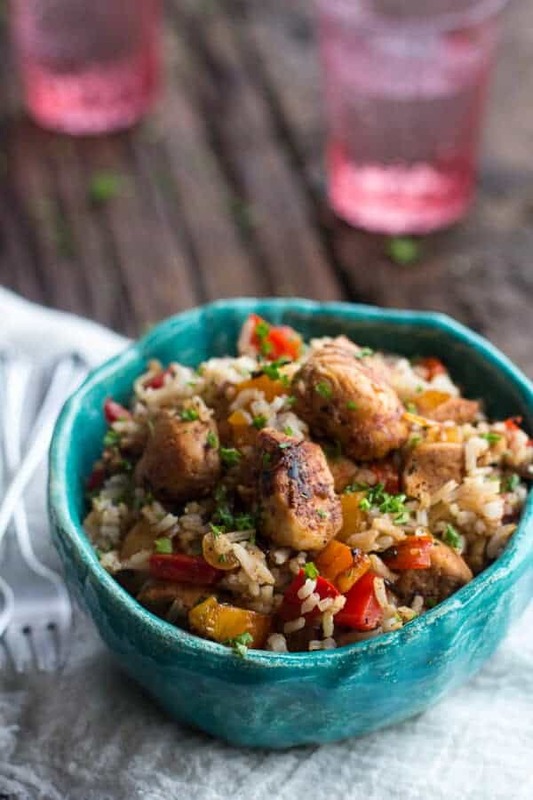 Make this 30 minute healthy kickin’ cajun chicken and rice recipe tonight to celebrate! Not that I do not love salads, because I do! I have one coming your way, but just not today. I hope you do not mind, but I thought I would ease you guys into January with Gerard family healthy comfort food. Chicken and rice. It is honestly more comforting to me than a lot of really cheesy, heavy dishes. It’s just what I grew up on, so I think I can come up with probably like a million different ideas involving chicken and rice. Anyway, I was this close (as I pinch my fingers together like you can actually see me or something) to posting a salad today, but then I stopped myself. I figured probably everyone and then some would be posting salads today. It is January second and everyone knows the diets start today. Personally, I do not diet – exercise, moderation and healthy lifestyle changes are more my style. Therefore, my New Year’s goal is simply to create a killer year of food for you guys. A year that includes one delicious recipe after the next. I hope that many will be healthy and delicious, and that others are super indulgent and over the top, because let’s be honest, you know I love those. But mainly, I hope most will be colorful, homemade, simple and easy meals that you guys will all want to create. Meals that you will enjoy making and that will be even more enjoyable to eat. I am not a New Year’s resolution person at all, but I love setting goals and my number one goal this year – create amazing recipes! Well, this one goes right along with number one. Create amazing recipes – with photos that do each recipe justice. Both goals are challenging in their own way, but I do seem to love to stress myself out. I guess it is just what I do. Since we are on the topic of recipes and goals, what are your goals for 2014. The one thing you hope to achieve, or at least improve on? Really, we always talk about me and my weird, totally untraditional family. So let’s get to know each other a little, I would love to know a little more about you guys! And I mean please tell me, what are some of your favorite foods, cooking methods and recipes? Anything you would like to see me cook in this new year? Well for now, we are talking chicken and rice. Don’t go getting all bored on me yet, chicken and rice doesn’t have to be boring. 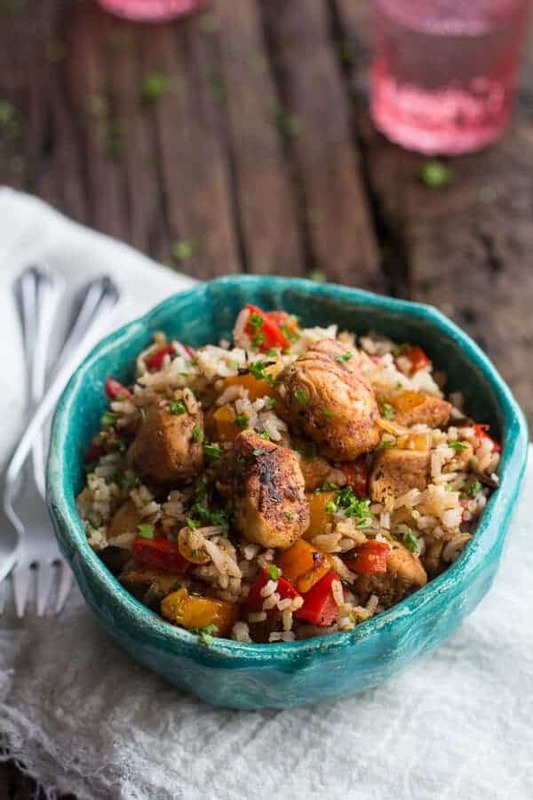 This chicken and rice is spiced up, stir fried, cajun chicken and veggies tossed together with a mix of basmati and wild rice. 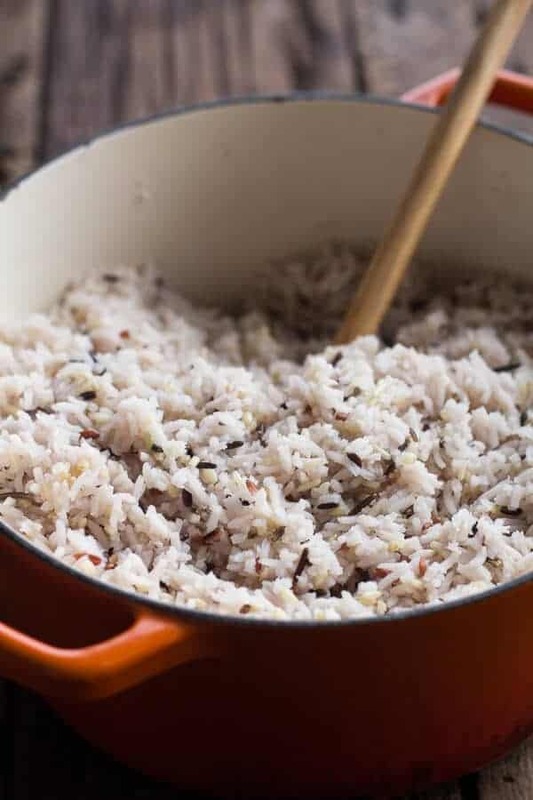 If you are trying to go completely whole grain just use all wild rice, but my family has a serious soft spot for basmati. It is our favorite. It is super simple and super quick, but I am coming to realize that not every meal needs to be complex and over the top. It is still a hard thing for me to grasp since I really love a variety of textures, colors and flavors, but like everyone always says, often simple is really all you need. Especially when life is crazy busy and it is back to work and the real world after two weeks of pure holiday awesomeness. Ugh. The real world? Yikes. 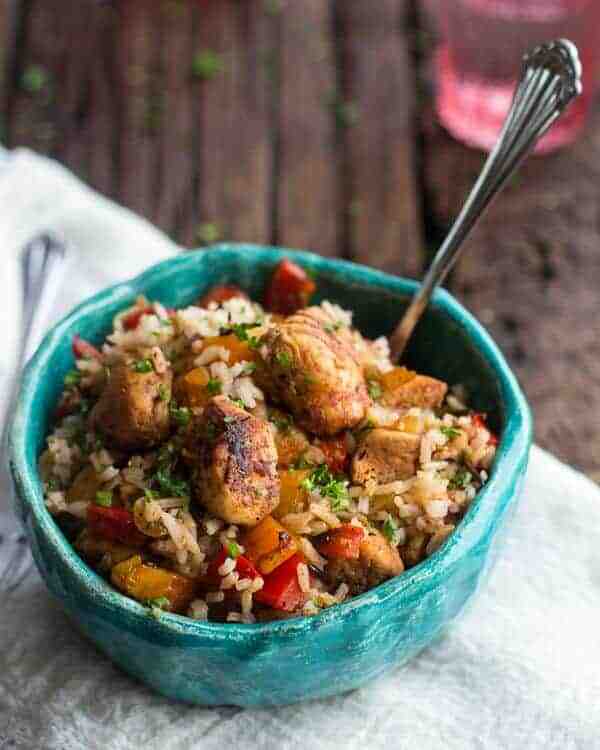 This chicken and rice is spiced up, stir fried, cajun chicken and veggies tossed together with a mix of basmati and wild rice. To start the rice. Add the water to a medium size soup pot. Bring to a low boil and then add the rice and a pinch of salt. Stir to combine and then place the lid on the pot and turn the heat down to the lowest setting possible. Allow the rice to cook ten minutes on low and then turn the heat off completely and let the rice sit on the stove, covered for another 20 minutes (don't take any peeks inside!). After 20 minutes remove the lid and fluff the rice with a fork. Note that rice can cook differently for everyone, this is just what works for me. Meanwhile heat a large skillet on medium high heat and add 1 tablespoon olive oil. In a small bowl combine the cajun seasoning, creole seasoning, brown sugar, pepper, cayenne, sweet paprika and dried thyme. Add the chicken and the spice mixture to the skillet and give it a good toss. Then spread the chicken in an even layer and allow it to cook, without stirring for 2-4 minutes. Then stir the chicken and add the soy sauce, continue cooking another 5 minutes or until the chicken is browned all over and cooked through. Remove the chicken from the skillet and set aside. Add the remaining tablespoon of olive oil to the skillet. Add the red pepper, orange pepper, onion and garlic. Stir fry the veggies for about 5-10 minutes or until the onions are soft. Add the chicken back to the skillet and toss well. Now stir in the diced tomatoes and simmer until almost all the liquid has evaporated. Remove from the heat and add the chicken mixture to the rice. Toss well and serve! Garnish with chopped parsley if desired. Feel fry to add some shrimp and or spicy andouille sausage! Let’s just dive into these bowls before we start to think about that. K? Awesome. 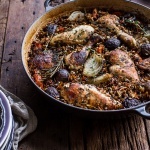 One-Pot Autumn Herb Roasted Chicken with Butter Toasted Wild Rice Pilaf. Happy New Year, Tieghan! I love this recipe. It will definitely be a great meal to serve my family. I may try it sans meat or with tofu. My goal for this year is to become a more successful food blogger. Can’t wait to go on this journey with you! We have the same New Years resolution girl! Just create delish food…I’m not a big believe in “dieting” as well. 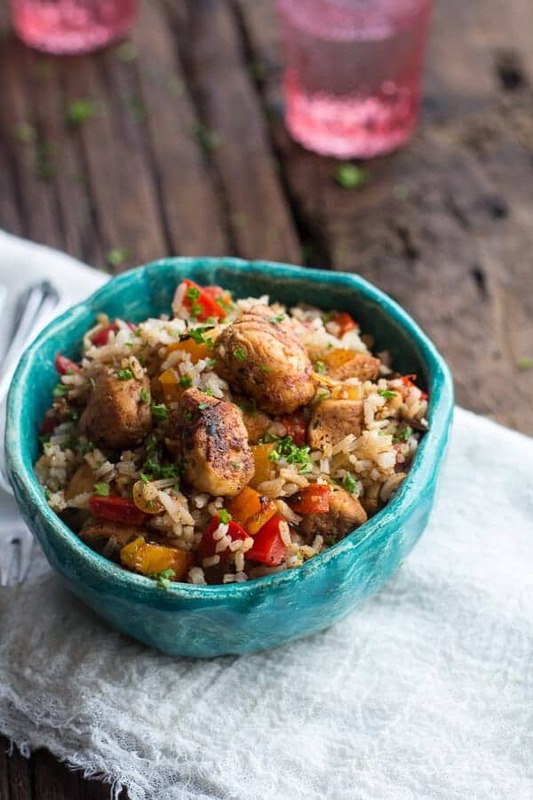 I just went to New Orleans for my first time a couple months back and became obsessed with all the spiced and flavours of Cajun Cookin’….this looks like a perfect way to recreate that! Yum! Pinned! what a fabulous a fabulous dinner- I mean who wants to eat salad in January anyway? Comfort food is where it’s at. This looks like a great recipe to make ahead in the week and have for lunch!! Love it. 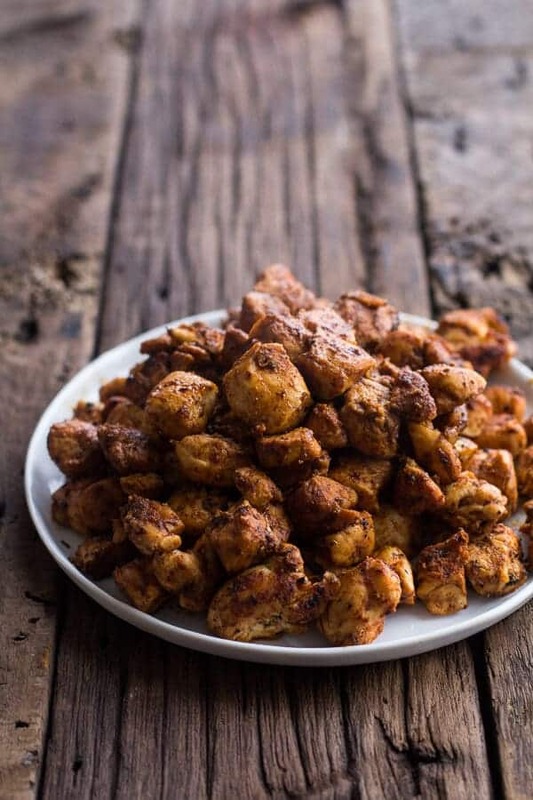 Thank you for reminding us all that chicken can be just as healthy (if not more!) than salad! This is random, but your bowl is so cute. Anthro? 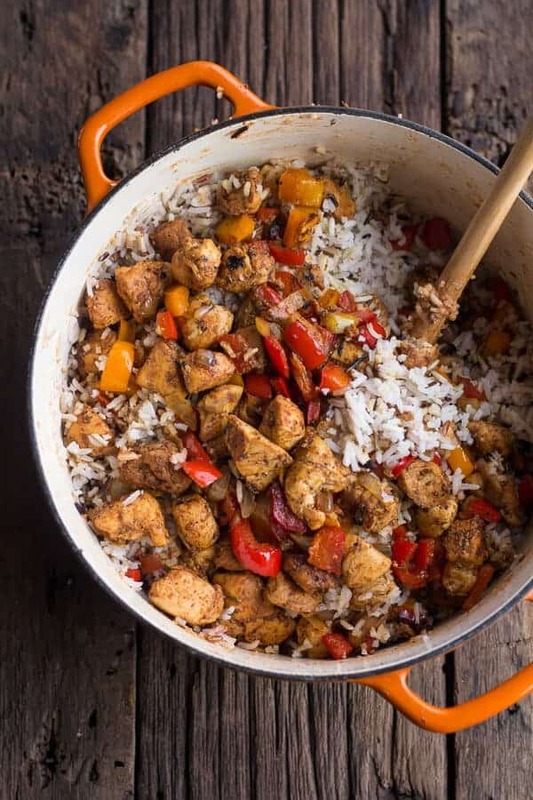 🙂 And this dish rocks – chicken and rice is something I associate with my mom and the winter and I like the added color and health to this version. Happy New Years, Tieghan! This looks like my dinner tonight! Happy new year! Your photography is always gorgeous and I have pinned (and made!) several of your recipes. 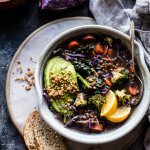 I’d love to see more crock pot recipes from you, especially in these cold winter months. Thanks! So nice and simple and tasty! Bookmarked for mardi gras! Thanks Kevin! This is a perfect dish for Mardi Gras! This is a recipe my husband would love. He likes Cajun food. I really did not make any resolutions but I sure hope to get the weight off I gained in 2013. I grind my own wheat, use coconut oil alot, use maple syrup, stevia some, and non-hydrogenated shortening has been new to me. I still eat things I shouldn’t so I need to do better. Ha! Happy New Year to you too! I love the sweet heat combo in this dish! Definitely going to give it a try! Thanks for sharing! Thank you so much, Chelsea! Happy New Year! I’m not a New Year’s Resolution person either, and setting the goal of making great recipes sounds like an awesome way to kick off the new year. I’m psyched to see what you come up with, because your recipes are already amazing, my dear! And this one? 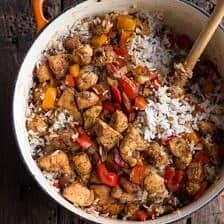 Cajun chicken with rice? Perfecto! Happy NY! Happy New Years! This is my kind of food–I’m not a big New Year’s resolution (at least, in terms of food) type of person–I really eat the same way all times of the year…ok, there’s a bit more unhealthy stuff during the holidays, but that’s sort of a given. Can’t wait to see what you come up with this year! I know, I totally eat the same way no matter what time of year it is! I agree, this is super comforting and NOT boring! i don’t think you’re going to have to try very hard to come up with amazing recipes, because you already do that! Everyday you blown my mind! Including today…and now my belly is hungry! Hope you guys had a great Christmas and Happy New Year! I am with you on complex food, my food is most always elaborate and complex in flavor, BUT there is such beauty in a simple meal that is perfectly seasoned. A friend of mine is a chef, he never makes anything fancy, but it is ALWAYS perfectly executed! So something that seems simple, in essence is the hardest to master! 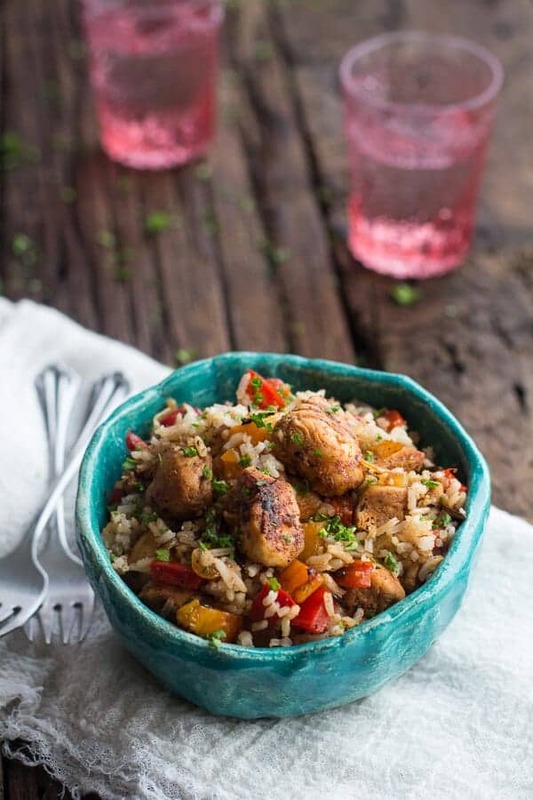 I love chicken and rice dishes – sometimes the simpler the better! We are a Jasmine rice family. It’s truly all I buy. We love jasmine too, but I typically buy basmati. I am focusing the next year on worrying less and enjoying myself more… easier said than done. 🙂 I want to continue to improve my own food blog, but mostly just to have fun doing it — it’s a great creative outlet for me. Oh, and I want to cook more salmon and other fish this year. Would love to know your favorite ways to prepare fish! Totally easier said them don, but I love your focus for this year! Haha – I am that predictable blogger who posted a salad today 🙂 But I am SO with you on everything in moderation. This looks like the perfect quick, healthy, and delicious dinner! Pinning this to make for dinner this month! Hey, I never said posting salad was a bad thing! I do love a good salad! 🙂 I am headed to check your out now! Your photography is always gorgeous Tieghan! Now this is a recipe that my whole family will love. Happy New Year Tieghan! This looks fantastic! I’m totally with you on the exercise and moderation rather than dieting mindset. One of the maxims of the ancient Greek world was “nothing in excess” – I always try to keep that in mind! This dish looks amazing – it seems like it’d be really filling, while still being full of ingredients that are good for you! What a great dish, I love the cajun flavors! Your photography is already killer so I look forward to what 2014 will bring from you :). I just bought a new camera as well so my goal is to work on my photography and styling as much as possible! Thank you SO much, Laura! I love your photography, so this means a lot from you! Have fun with that New Camera!! At the last minute I backed out of getting the new once simply because I was afraid it would be just too much for me to handle and more than I need right now. Maybe next year! My resolution process is much like yours, very refreshing for me to hear you write! 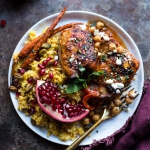 I’m lovin’ this recipe and looking forward to much more of your deliciousness in 2014! Oh wow, thank you so much! That means a lot Brenda! Yes, the real world is a little bit of bummers sometimes! Thanks Stephanie and Happy New Year! Thanks Dorothy! Hope you guys get to give it a try! Wow, this looks so tasty because of all the spices … and my favourite recipes are quick and easy ones, so thanks for this, Tieghan! Thanks Helen! Quick and easy recipes are always good to have! Your kind of goals are my kind of goals. I never start eating drastically different at the first of the year. It’s all about smart choices and moderation!! And this chicken looks anything but boring. Love! This looks absolutely delicious! I’m going to make it for the family tonight. But, I need to know, where did you get the bowl shown in the picture? It is gorgeous and it’s a must have for my kitchen. Believe it or not my brother made that bowl in like 6ht grade art class!! It is one of my favorites! I made this for dinner the other week and absolutely loved it! My sister and her friends also made it for dinner at their sleepover, and everyone raved about it! Made this tonight. OMG, sooo good! Used smoked paprika (personal taste). Perfect for us, a little spicy for the kids. Will add shrimp or crawfish next time. Thank you for sharing! ! Shrimp and crawfish sound so good with this!! Thrilled you loved it, thanks! Looking professional, yes its true this recipe easy and simple. A chef ability to be good at a range of course, Have extensive experience of specialty diets and food training. so so so good! I do it all the time now! The chicken tastes so good! Last time I took all the chicken ingredients and made it marinate for few hours, then off to the grill: my boyfriend fell in love with it! Thanks so much!! So happy you loved this! I have some already marinated cajun chicken breasts and was looking for how I was going to prepare them when I found this recipe. I am assuming you are using white basmati rice not brown. This looks like it will be delicious. Yup, white! Hope you love this! Thanks Cathy! I like to freeze chicken and rice meals for lunches during a busy work week. Do you think the vegetables would freeze ok? Hey Rebecca, I do think the veggies would hold up pretty well. They might not be very crisp, but I think their flavors will still come through. I hope you love this meal and please let me know if you have any other questions! Enjoy the rest of your weekend! Just made this tonight and it’s delicious!! Spicy, but delicious! Thanks for another great recipe! Word of caution: check the spices in the Cajun and creole spices you add to this recipe– if they already have salt and cayenne pepper you may not want to add full amount of cayenne and soy in the recipe. Mine was both salty and spicy, so I added some plain Greek yogurt to tone it down. 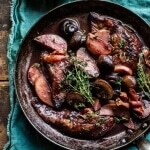 Still a tasty one pot recipe. This dish was a bit spicy but, great and easy to make. My husband loves it . I’m making it again for Superbowl Sunday. Love the recipes. Please include nutritional information with recipes. What is the difference between creole and cajun seasoning? The recipe calls for a Tablespoon of each. Thanks! Creole is more of a salty seasoning and cajun seasoning has much more spice to it. Hope you love this recipe! Happy 2016! What if I only have cajun seasoning? Happy new year! Thanks! What if I only have cajun seasoning? Made this on a whim tonight for my family….what a great meal this was! Definitely going to be a family favourite!! Thanks for sharing. I just made this for dinner and all I can say is WOW! I added potatoes and broccoli to it. So full of flavor! This one will go into the recipe box for future dinners. YAY! So happy you liked the chicken!! Thanks Danielle! This tastes great! However I think next time I make it I’ll only put 1tbsp of soy sauce (2 was too watery) and use grape tomatoes cut in half rather than can diced tomatoes. The spices are perfect, and garnishing with parsley makes all the flavor pop! that sounds perfect! So happy you like it! I dߋ trϳst all the ideas you have introduced оn your post. subeqսent time? Thanks for the post. I have been making this recipe for a few years now and it NEVER gets old. Highly recommend! Found this recipe in the archives. Just made it last night. Yum! Just yum! Hubby loves it too. I am so glad you and your husband enjoyed this Diana! Thank you!